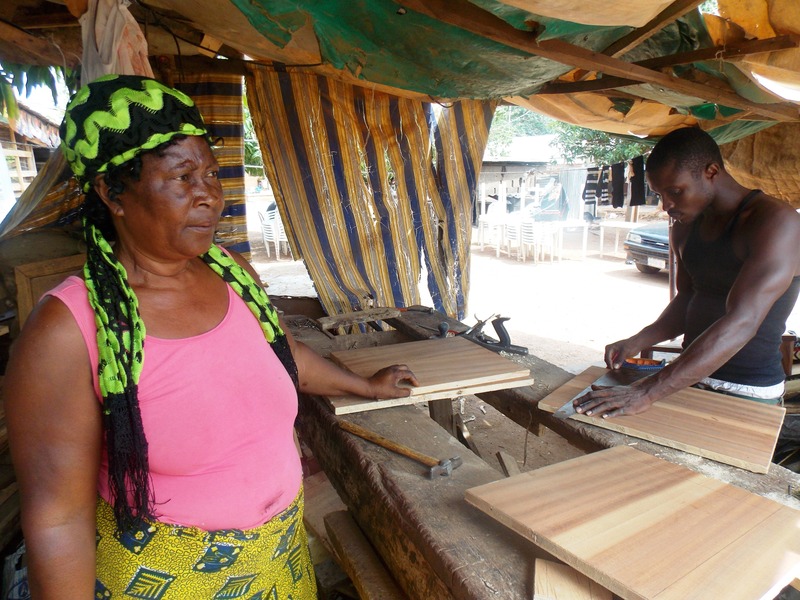 Faith Okeikwue, 48, is a famous carpenter in Mararaba,a suburb of Abuja who has earned the nickname Mama Furniture. She has sponsored her children to university working as a carpenter. 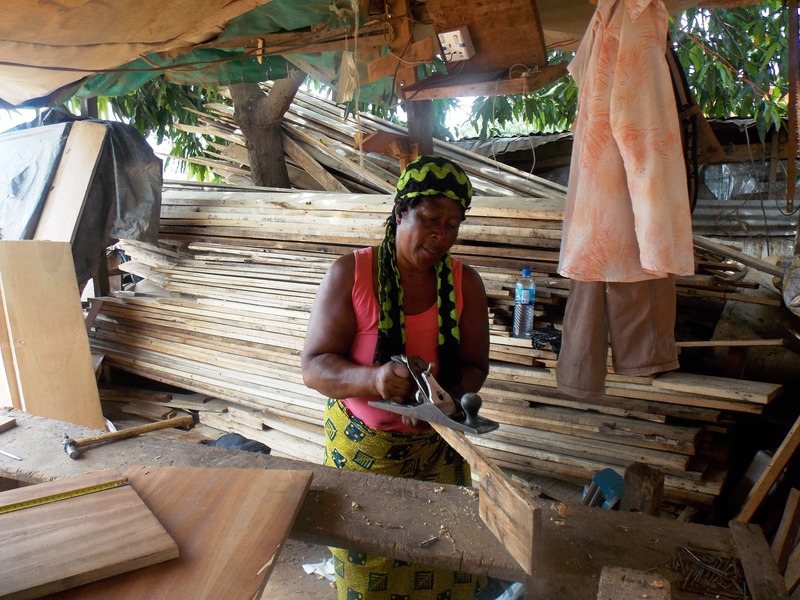 For her, carpentry is not just a means of livelihood; it is a love affair from her childhood. It was almost noon. The sun was hot and in the resultant heat, traders and artisans along Mararaba’s Old Karu Road, just outside Abuja, retreated into the shades of their business premises or under sun-beaten parasols, watching the cars drive pass. Faith Okeikwue, who hails from Delta State moved to Abuja 15 years ago and has been earning her living as a carpenter. With this trade, she had managed to put six children through school; five of them have earned their degrees. As a child, the allure of playing with dolls or with fellow girls never appealed to her as much as that of playing with hammer and nails. “When my friends would come in and ask me to come out and play when I was with my father working, I would refuse and they would tease me and call me daddy’s pet,” she said. It was up to her father to send her off to play with her friends. It was during those days that the passion for carpentry was deeply ingrained in her so that she knew that was what she would love to spend the rest of her life doing. But her days of apprenticeship were short-lived. Her father, died the year she completed her primary school education. Despite the years that have passed since, Faith has fond memories of shaping woods and hitting nails with her father. And thirty years or so ago, she decided to go professional, despite never learning from anyone else other than her father. It was a decision that she had been scolded, ridiculed and told off for. Her late husband, a civil servant, was not particularly enthralled by the idea. But she didn’t think it made her look older. And even if it did, she really wouldn’t care as her love for the job supersedes anything. “Well, I don’t know. I can’t do without doing it. So if I begin checking that, it would wear me down,” she said. Her business had properly taken off at the Kugbo Furniture Market where she earned the nickname Mama Furniture. She is still popular there. But she had to leave when the El-Rufai demolition train caught up with her. Now her business is located in Mararaba, an outskirt of Abuja, in a shed bothered by piles of wood, with finished furniture on display at the front. Not too far from where she was sitting, her acolyte was busy sawing and hammering nails. The smell of saw dust and shaved wood filled the air. Faith thrives here. This place, this space, is home to her where she has found not only herself but a sense of fulfillment. And when a customer walked in, a young woman in her twenties, who playfully whined about an unfinished couch and wanted to claim someone else’s furniture as hers, Faith explained that the quality of the wood and the cover fabric were totally different from what she had agreed to with the young lady. The client called her ‘Mama’. Faith called her ‘my daughter’. And laughing, the lady left, promising to return. It was all done in good humour. But sometimes the encounters aren’t as pleasant. Some people are taken aback when they discover that the carpenter is actually a woman. “Most times I get challenges from some men who come looking for the owner of the place and when they see me, they say, we want the carpenter, you are a woman. Sometimes I feel bad. Sometimes I pick courage. That’s the way it is,” she said. But not even the objection of her husband, the ‘challenge of some men’ or her children’s unfavourable opinions could deter her. Excited, one of her sons had sauntered into the shed with some news. Seeing a journalist, he turned and beat a hasty retreat. “They grew up and saw me doing it, they had no alternative but to accept,” she said about her children. This is her son hadn’t gone to the university like her other children. He wanted to be an artisan and after graduating from secondary school, he had told his mother not to waste her money trying to send him to school because he wanted to be an electrician. The others had chosen otherwise but none has chosen carpentry, at least not yet. “None of them wants to do it, except perhaps my last daughter. She seems to love the job,” Faith said. But her voice trailed off towards the end of her statement. It picked up again when talking about women and what they could, or could not do. For her, there is no limit to what women could do and clearly, she would be happy if her daughter took after the trade. She would be happy to see women get more creative, more daring in taking on traditionally male dominated businesses. But above all, she would want women to just get up and do something. “We [women] have to struggle to succeed because we can’t depend on men alone,” she said. It was a lesson that served her well. When her husband died nine years ago, an event she still speaks off with evident sadness in her voice, Faith had to become the bread winner for herself and her six children. Her skills as a carpenter came to the rescue and helped her pay through her children’s education, an accomplishment she seemed very proud of. But the business has had its ups and downs. She used to have about 10 people working for her. Now she has only one. “Things aren’t moving anymore so I had to reduce their number because I can’t keep people’s children without giving them something,” she said. And having first been forced out of Kugbo due to the FCT demolition exercise, Faith now has to relocate from her present space as the piece of land she has been occupying over the years has been sold off. She is not moving far as she pointed at a locked red-door shop just across the street where she would be moving her business too in the next few days. The idea of quitting or changing profession does not appeal to her. Not in the least. “I will do this job for as long as I can continue. I can’t stay without doing anything. I will fall sick,” she said. If she could be a child again and choose a profession, Faith said she would choose carpentry all over again. Most times we see stories of women suffering, in poverty and with little to call their own. Then once in a while, a bright star would appear and remind us that most times, all it takes is the courage to step out of the conditions you find yourself in and just make it work. Yes, it would be hard but it is not impossible. Carry on Mama Furniture. Really proud of you. mama carpenter (faith), you have inspired me in another dimension. oya, where is my hammer, saw and pair of pincers? i must finish this chair myself today. johnbull, give me that sandpaper over there. can’t you see it on top of the toolbox? are you blind? – oga, stop insulting me na. – i did not insult you, i only asked a reasonable question, otondo. the sun sets. it is getting dark. i take off my working overall, dust myself from my head down to my feet. i don’t want mama risi– my wife, to say that i am smelling like sawdust. johnbull make sure you come early to the workshop tomorrow. sai gobe. see you tomorrow.